Philistines attack David in the Valley of Rephaim. The Lord tells David He will hand them over to him, so David goes and defeats them. They abandoned their idols, which David carried off. Again, the Philistines come before David and this time God tells them to circle around and wait for Him to go before them (which he’ll know by the sound of marching in the tops of the balsam trees). 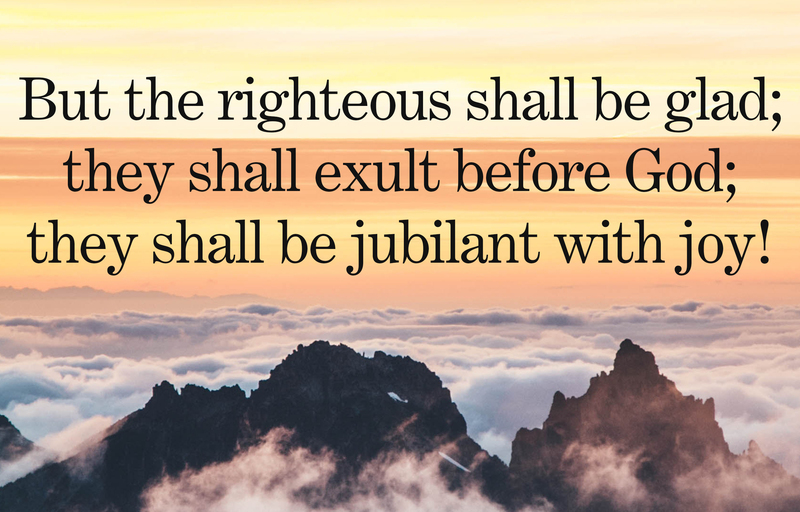 David prays for God’s enemies and foes to be scattered and the righteous be glad and rejoice. God gave the Promised Land to His people. He provides. He bears our burdens. He is awesome and worthy of our praise. 6) Part personal Question. My answer: David prayed to God to ask God what he should do, which David did. In careers, in jobs, in my future, and in my health. I think He’s answering all in His time. 7) His justness, his care of widows and the fatherless. His giving of the Promised Land. His delivering of the enemies. His scattering of nations. His majesty. His power. 8 ) Personal Question. My answer: His utter faith on God for everything in his life. David’s constant praying and asking God what to do. His constant praise of God. God as his center. This is what challenges me. The key is asking God always for everything in your life. What your next move will be in all areas: career, spiritual, money, battles, relationships, etc. Then obeying and taking action. As David sought God and looked to Him for guidance, he was blessed. God honored David’s dependence on Him and gave him the promise of victory. David always triumphed when he sought and obeyed God. God directed David differently in this battle. Even against the same enemy, not every battle is the same. How do you respond to the sound of the balsam trees? The footsteps of angels is what some say the sound in the balsam trees was. When we sense that the Lord is at work, we must advance quickly, and we will see a great victory won. King James version says: “thou shalt bestir thyself.” When you hear the work of God happening, bestir thyself . When we see the work of God happening around us, it is like the sound in the mulberry trees – the rustling sound should awaken us to prayer and devotion. A time of crisis or tragedy is also like the sound in the mulberry trees – the rustling sound should awaken us to confession and repentance. The title of this Psalm is, To the Chief Musician. A Psalm of David. A Song. Most commentators believe this Psalm is connected with the coming of the ark of the covenant into Jerusalem (2 Samuel 6) celebrating not only that event, but also the faithfulness of God to give Israel victory over her enemies, secure enough to bring the ark into Jerusalem. Using the phrasing of Numbers 10:35, David proclaimed the triumph of God over all His enemies. When God goes forth no opponent can stand against Him. They are all scattered. Since Moses said those words when the ark of the covenant led Israel from Mount Sinai, David knew it was appropriate to say the same words as the ark came to Jerusalem, its resting place. As David brought the ark of the covenant to Jerusalem (2 Samuel 6) he made a dramatic historical connection. The idea was simple, both with Moses in the Exodus and David with Israel in the land. It expressed the confidence and the need of God’s people: “God, go before us and take care of our enemies. It’s too dangerous ahead without You.” This spirit of confident dependence is appropriate for every believer. God’s enemies have no ability to stand against Him. We are to praise God with knowledge of His character, and knowing Him personally. Why should we rejoice in God? 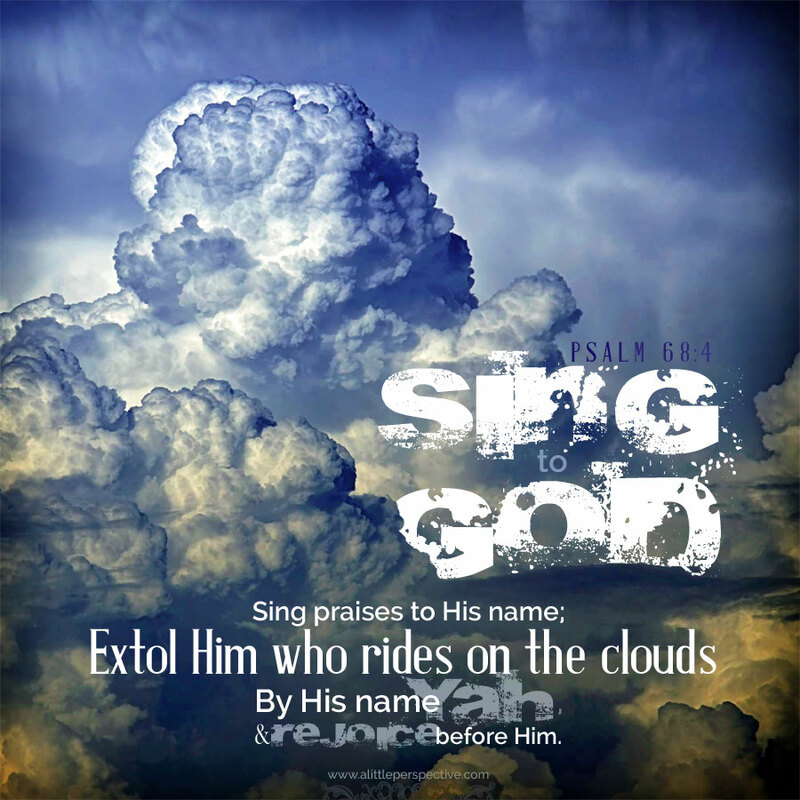 God rides on the clouds, in victory and triumph over all the earth. God has revealed Himself to humanity in the name Yahweh, showing His love and loyalty to His people. God’s greatness isn’t only defined by military-like triumphs. It is also seen in His compassionate concern and care for the weak and needy. The name Yahweh is connected to God as the Becoming One (Exodus 3:13-14), the God who becomes what His people need. It is significant that God chose women to be the first messengers of the good news of the victory of Jesus’ resurrection (Matthew 28:1-10, Luke 24:1-10). The New Testament says that women should not be in positions of doctrinal authority (1 Timothy 2:9-14), but they certainly can and should proclaim the good news of God’s victory in Jesus Christ. Zalmon is another name for Mount Ebal in central Israel, which many would consider more of a high hill than an actual mountain. The meaning of this line is not entirely clear, and has been the source of much speculation. Bashan was further north in Israel, in the region of what today is called the Golan Heights. Bashan was an impressive mountain, even a mountain of God and part of Israel’s heritage. Yet it and the other mountains seem to fume with envy when they see how God has favored Zion. God chose Jerusalem even though there were higher and more spectacular mountains. Yet as He often chooses the weak to confound the strong and the foolish to mystify the wise, He chose Zion over Bashan. By God’s command (Deuteronomy 17:16) ancient Israel never had many chariots. They were unneeded because God fought for Israel, and He had power greater than thousands of thousands of chariots. With the direct leading of the Holy Spirit, the Apostle Paul quoted Psalm 68:18 and applied it to Jesus, keeping the context but changing one key word. Paul quoted, When He ascended on high, He led captivity captive, and gave gifts to men (Ephesians 4:8). Paul applied this to the ascension of Jesus into heaven and His sending of the power and the gifts of the Holy Spirit to His Church. The one word Paul changed by the inspiration of the Holy Spirit was received gifts to gave gifts. In describing God’s victory, David used an image from Genesis 3:15 where God promised that the Messiah would strike a fatal head wound against Satan. After the great triumph over their enemies, David and Israel could bring the ark of the covenant into Jerusalem (2 Samuel 6). In the procession of the ark, the small tribe of Benjamin had a prominent role. This showed wonderful grace on David’s part because his predecessor King Saul was from the tribe of Benjamin and many kings of David’s day would refuse to give them any honor at all. Whatever victory generals may have won and inspiration they received from this Psalm, the victories did not last. The lasting victory still waits for the Messiah’s great kingdom.